Enough said! Uluru, Kata Tjuta National Park (photo: Tourism Australia). 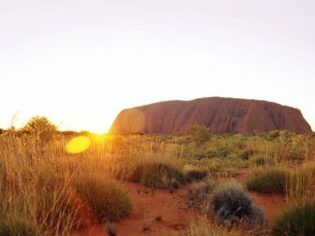 “Out here,” says the latest campaign for Ayers Rock Resort, “you can touch the silence”. Forgive us for borrowing words from an ad, but there’s really no other way to put it. The specialness of our Red Centre can’t be overstated. And there’s no better way to get there than by road trip. Whichever direction you’re coming from, take your time, allowing the magic of the region to slowly seep into your bones. Kata Tjuta, Kings Canyon and the MacDonnell Ranges are equally as spell-binding as Uluru; be prepared. As Lee Atkinson says, “If you only ever go outback once in your life, this is the trip to do”.